"They'll kill everyone. You can't stop them." The final six installments in the Space: 1999 series contain some of the better Season Two episodes. The "monster of the week" formula seen on the last set is pretty much gone. Instead, there are new phenomena and races to contend with, and the plots are a little more complicated, relying more on the actors than special effects to make their point. As with most of the second season, the humor is more overt, as are the relationships, and the overall feel of the cast is more relaxed and comfortable in their roles. The storytelling in this collection has some interesting twists. Two of the standout episodes, both written by Dr. Who alumni, highlight the addition of Catherine Schell as Maya, the shapeshifting alien from the planet Psychon. Rescued from her dying home world, the metamorph believed she was the last of her race, and discovers she is not alone in Dorzak. Here, she comes face to face with a respected philosopher and poet from her past, and has to learn his true intentions. The episode also gives Nick Tate (Alan Carter) a love interest of his own. In The Dorcons Maya confronts an indomitable race who use Psychons to increase their longevity, giving Schell another powerful performance trying to shield the crew of the moonbase from a devastating adversary, even if it costs her her life. Another fun installment gives Martin Landau centerstage as he tries to outwit a cruel prison matron and her bullwhip-sporting female guards. Reminiscent of many William Shatner situations in Star Trek, Koenig is slated as a boy toy, which in itself is pretty amusing. A key element in the series is its special effects, which feature great, old-fashioned model work, using multiple exposures to build scenes in camera. Although the series has a tendency to repurpose the models, this traditional method of creating illusion is one that should be appreciated, long before its modern CGI equivalent. The design of the spacecraft and moonbase is striking and memorable, and adds immensely to the atmosphere. Model work aside, like the rest of the series, visual effects range from impressive, with Alpha collapsing under attack in The Dorcons, to mediocre, such as the swirling screen presence of The Lambda Factor or the spotlight psychic probe seen in countless episodes. However, even when less than awe-inspiring, these effects lend a defining character to the show. With its two seasons concluding here, fans can now enjoy the good and the not so good of Gerry and Sylvia Anderson's second live-action TV series. At the every least, it offers an imaginative look at the future, with good diversity of concepts and situations, while offering solid action, likeable characters, and the odd bit of cheesy fluff. The refurbished second season is a joy to behold, and will hopefully attract new fans to the classic science fiction genre. While travelling through a peaceful region of space, tempers are frayed among the moonbase crew. Equipment is malfunctioning, which Maya attributes to a strange phenomenon in space. A medical assistant turns up dead, and John is seeing ghosts. When members of the crew start exhibiting increased psychic abilities, it has something to do with The Lambda Factor. A good, character driven episode. The Seance Spectre A habitable planet may have been discovered, but in order not to raise false hopes, Koenig keeps the news from the rest of the crew. A band of dissidents into astral projection take over command center and predict they have found their new home. When Koenig learns they are on a collision course with the planet, radical measures are taken—the complete evacuation of Alpha. This episode acknowledges the mission of the first season in finding a new home, and the effects of prolonged exposure to the barrenness of the lunar surface. A bit overplayed, but enjoyable. A spacecraft emitting the Universal Plague Warning approaches Alpha, requesting permission to land. With one of her crew needing medical attention, Sahala (Jill Townsend), the ship's commander, assures Dr. Russell that the plague is contained, but when it turns out she has one of Maya's people captive, the quest is on to learn the truth. Is Dorzak (Lee Montague) the criminal he is made out to be, or merely a prisoner of a hostile race? One of the better Season Two episodes, pitting the crew against each other in a battle of minds. The moon approaches a pair of potentially hospitable planets. Koenig crash lands on a penal colony run by a group of Amazons, where prisoners can gain the freedom to return to their home planet by eluding capture during a hunt, but he has learned a deadly secret about what awaits them. Elizia, the leader of the colony, decides Koenig will make an entertaining companion, and convinces the moonbase that he is dead. Soon he will be the quarry in a game of life and death on the Devil's Planet. There is a bit of print damage in this one. Martin Landau is the only principle character appearing in this episode. Alpha has discovered an M class planet and conduct studies on its viability for relocation. At first it appears to be uninhabited, but when a strange phenomenon leaves a crew member dead and causes Tony to go mad, Koenig has to hunt him down. Meanwhile Alan is busy trying to break the seal that could lead to an underground civilization. When the planet suddenly turns hostile, trapping the landing party, Maya and Helena must find a way to reach them, but it may be a one-way trip in The Immunity Syndrome. The Alphans find themselves at the mercy of The Dorcons, a militarily superior race whose leader requires Maya's assistance to gain his immortality—by taking her life. After being outclassed by their might, Koenig has no option but to surrender her, but the heir apparent to the Dorcon empire has other ideas about the future of his people, and sees Maya as his ticket to the throne. Some strong performances by the guest cast, and good visual effects as the moonbase is under attack. Could the Dorcons be the predecessors of the Borg? Image Transfer Review: Once again, the restored image is simply wonderful. Colors are bright and vibrant, black levels spot on, contrast and detail are excellent. Source damage is very limited, and grain is naturally rendered. If only all 1970s TV shows could look this good! Audio Transfer Review: The mono soundtrack also stands up well, with a natural full sounding presentation. Dialogue is clear and audio has no technical deficiencies. A solid transfer. Extras Review: Disc 15 includes a behind-the-scenes documentary with setup footage; Brian Johnson provides the commentary. He introduces many members of the team, taking us from the model shop to the shooting stage. Also included is a brief TV spot for an amusement park's Space:1999 exhibit, and a commercial for the Space: 1999 tie-in "Ice Lolly" from Lyons Maid. An episode-related photo gallery completes the special features. Disc 16 houses a collection of 1976 interviews for British TV from the set of A Matter of Balance and features Martin Landau, Barbara Bain, Catherine Schell, co-creator Gerry Anderson and producer Fred Freiberger. They discuss the changes made for Season Two in the characters, tone and look, and talk about working together. One thing that stands out with these is the proliferation of smoking on camera, which is rare to see these days. There is also an interview with special effects director Brian Johnson, who gives an overview of the construction Eagles and how they are filmed. A 13-image episode gallery, and 25-image production gallery round out the extras. Unfortunately, the much anticipated Message from Moonbase Alpha,, a fan-created showcase on the series, was unable to be secured in time for production. 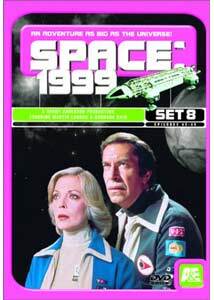 However, a bonus disc containing the feature and three remastered first season episodes with commentary have been produced for sale with the Space: 1999 Megaset, exclusive to a single vendor. It is unclear at press time whether this bonus disc will be made available at some point to those who have purchased the individual discs. The two-part documentary on the series, which was also originally announced for inclusion with Season Two, is also missing in action. The final pair of discs in the series bring another six episodes to DVD, with some of the better Season Two installments. These look great, and have a good collection of extras, even without the exclusive bonus disc, which adds even more extra value to the complete set. Space: 1999 continues to be one of the standout science fiction television series from the 1970s, with good action, a great cast, and a decent selection of storylines. While not all episodes are exceptional, they offer solid entertainment value, and for those who enjoy classic sci-fi, this series is a keeper.